Following the recent release of new screenshots and online previews, two new magazine previews for GTA IV made its way to UK readers. 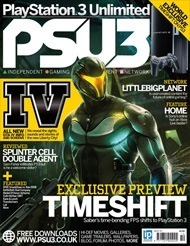 First is a magazine called PlayStation 3 Unlimited, still with the same introductory preview, and the Official PlayStation 2 Magazine, who seems like they're just writing a lot of speculative information. Firstly, PSU3 says that there are four different camera angles to choose from when inside a vehicle, and that one of them allows you to get an almost first-person perspective, looking across the car bonnet (Something which can be often seen in racing games). OPM 2 on the other hand provided a lot of information that doesn't look like they're all straight from Rockstar. For instance, they said that crossing the entire map will take you around an hour. This contradicts the information we received prior about Liberty City being smaller than San Andreas, so we're not going to take this seriously, and besides, it just sounds impossible. In real life, driving from Manhattan to JFK Airport takes about 40 minutes. We also received the unwatermarked versions of the recently released screenshots in their original quality yesterday from Rockstar Games, be sure to check them out in our updated screenshots gallery. Special thanks to Matty for sending over scans of these issues!